Be the first to share your favorite memory, photo or story of Kristin. This memorial page is dedicated for family, friends and future generations to celebrate the life of their loved one. Of Minocqua, formerly of Sheboygan, was called home by her Lord and Savior on January 29, 2019 after a short and courageous battle with stomach cancer. She had been at Sharon S. Richardson Community Hospice the past month. Kristin was born September 12, 1981 to Mike and Kathy (Fieck) VanDeKreeke. 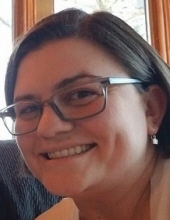 She attended Trinity Lutheran Elementary School and is a graduate of Sheboygan Area Lutheran High School, Class of 2000. Kristin was a member of Trinity Lutheran Church in Sheboygan before joining Rock of Ages Lutheran Church in Minocqua. On February 17, 2013, she was united in marriage to Christopher Kanzelberger at the Sheboygan Weill Center. She treasured being a part of an instant family. Kristin had several office jobs while living in the Sheboygan area. Most recently, she enjoyed her position at Wilson Mutual Insurance. Three years ago, the family moved to the Woodruff/Minocqua area. Her happiest career move was working as Town Clerk in Woodruff. She had also served as Deputy Clerk and treasurer for the Town of Woodruff. She loved the people there. Kristin was devoted to her husband and six stepchildren. She loved her family and enjoyed cooking and baking. She took pride in developing her own cookbooks and excelled at photography. Recently, she started the Lakeland Area GFWC women’s club in the Minocqua area, serving as their president. This was another achievement of which she was very proud. Kristin’s smile was infectious and her heart was big! She touched so many lives, including during her journey with cancer. Kristin is survived by her husband, Christopher, six stepchildren, Hunter, Austin, Jade, Mason, Ella, and Lily, her parents, her sister, Beth Kohl (Riverview, FL. ), mother-in-law, Karen Kanzelberger (Paul Koch), brother-in-law, Chad (Amy), niece and nephews, Lauren and Gavin Kohl, Blake and Zach Kanzelberger, many loving aunts, uncles, and cousins. She was preceded in death by her grandfather, William VanDeKreeke, grandparents Robert & Wilma Fieck, father-in-law, John Kanzelberger, Uncle and Aunt Ray and Lenore Micetich. A memorial service will be held at Zimmer Westview Funeral & Cremation Care Center W2132 Garton Rd., Sheboygan, on Saturday, February 2 at 1:00 pm. Kristin’s cousin, Rev. John Fieck (Ogden, Utah) will officiate. Visitation will be at the funeral home from 11:00-1:00. A memorial service will also be held at Rock of Ages Lutheran Church, 10441 State Hwy 70, Minocqua on Monday, February 4. In lieu of flowers, memorial funds for Sheboygan Area Lutheran High and Sharon Richardson Hospice are being established in Kristin’s name. The family would like to thank the staff on the oncology floor at St. Joseph’s, Marshfield, and staff of Sharon S. Richardson Community Hospice, Sheboygan Falls. The love and support our family received during this journey has been such a blessing. To send flowers or a remembrance gift to the family of Kristin Marie Kanzelberger, please visit our Tribute Store. "Email Address" would like to share the life celebration of Kristin Marie Kanzelberger. Click on the "link" to go to share a favorite memory or leave a condolence message for the family.